Congratulations New House – Join in the fun when someone you know has made the big step of buying permanent housing. After a busy day you will seek peace and solace, for which your new home will be the place. Congratulations. Beautiful couples like you deserve beautiful homes like yours. Congratulations. Bringing you happiness year after year. 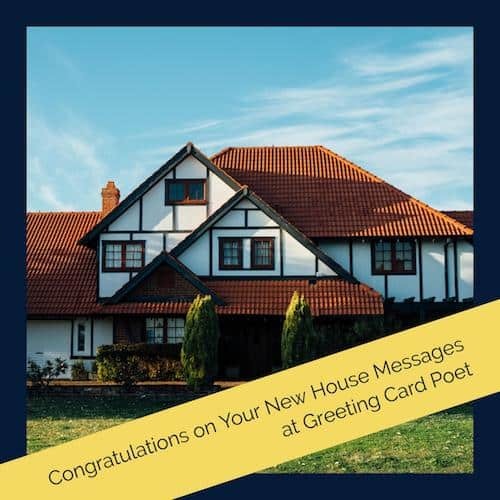 Congratulates for your new home. I hate to be the bearer of bad news but the worst part of owning such a beautiful home like yours is that you will never feel like leaving it. Guess we will be seeing less of you outside now. Congratulations for becoming the owners of a home as beautiful as the owners themselves. Congratulations for buying a house which is so luxurious and fine. Here’s wishing you good luck as we dine. Congratulations for buying yourself a new home and locking yourself in a cage called mortgage. I have no words for your new home because I can’t find words that are as beautiful as the home. All I want to say is congratulations. May your new home keep you cozy in winter, cool in summer and sheltered during the rains. May your new home also give you a prosperous life free of pains. Congratulations for your beautiful home. New houses are all about cement, bricks, mortar and wood. New homes are all about loved ones, family, parties and food. I am very happy for you and your new home. Nurture your new home with love and care so that your family never has to face despair. Congratulations on your new home. Putting your foot in your new home is one of the best steps that you have taken in your life. Congratulations. That’s filled with joy and cheer. The day you step into your new home does not make your life complete, it makes your new home complete. Congratulations. The walls of a new home will always remain cold, until it is occupied by family members, young and old. With a beautiful family and a lovely home, you have simply struck gold. Congratulations. There are lots of new memories waiting to come inside, as you open the doors of your new home wide. Best wishes to you and your family as you move into your new home. Warm your new house, by living the happy times in it with your family and spouse. Congratulations on your new home. What a blessing a home is, may God bless you and your new home. When the sun sets in the west, the view from your living room will makes your house the best of the best. Congratulations. When you bought your new home you did not just fulfill your need, you accomplished a deserving feat. Congratulations. When you enter your new home, heave a sigh of relief. This is a new start to your life and time to turn a new leaf. Congratulations on your new home. Wishing that your new home brings you nothing but contentment and pleasure. You can rent a house but you can never rent a home. Congratulations for your new home. You may be under pressure to pay back your home loan, but your beautiful new house will surely give you no reason to moan. Congratulations for your new house. You will not realize the value of your new home, until you come back from a stressful day at work and lounge in a place that you can truly call your own. Congratulations. Your new home is an investment that will reap rewards for a lifetime. You made a wise and beautiful choice. Congratulations. Your new home is just not a new roof over new walls. It marks the beginning of a new life, new memories and most importantly, a new mortgage. Your new home is the only place you can be carefree without a worry. Your new home is also the only place you will feel beautiful even without any makeup on. Congratulations. Your new home may feel like a heavy burden of a mortgage right now, but ten years later when its value appreciates you will say Wow. Congratulations for your new home. Your new house is a tree from which memories of your life will form permanent branches. It will also be a permanent reminder of your roots. Congratulations.